Discussion in 'Norton Commando Motorcycles (Classic)' started by DogT, Aug 7, 2010. I may need to pull one of my rockers out to replace it, so was searching around for a puller. Thread into rocker shaft is 5/16-26 CEI. Found the studs and nuts on left over crank parts are 5/16-26, so threaded the stud into the rocker shaft and was looking for a spacer to put on it. Lo and behold the spacers from my left over old isolastics work a treat. Used the smaller one with the donut on it to get it started and plan to use the longer one to keep it going. I may have to judiciously use lots of 5/16 washers, but it looks like it is do-able. How do I get this thing back in, maybe a clamp will press it in, I have one that big. Don't press it back in cold (you might mess up the bore) but heat up the head and slide the spindle back in). How hot can I heat it? I've got a small gas grill I can put it in. The seals are installed. If I put the shaft in the freezer will it pretty much just slide in without a bunch of work? And don't pull them out cold, either. But you shouldn't need a lot of heat. About 80-100°C is usually enough. You can locally heat the head with a gas burner until water evaporates then slide the spindle back in (last bit you might have to tap it in). Everything in the head should be ok up to 400'F as thats possible in very hot tuned engines, though 375'F is more likely tops most will ever see. Boiling hot should be more than enough along with froze spindle. Don't need to be much a snug fit as covers keep aligned and stable. Rocker arm fit on spindle is what matters. While the rocker arms are free I Highly Recommend to grind some meat off the rocker ends where they almost foul each other in use but snag and foul push rods placement before able to use. After relieved p-rod just slide right up fully 1st time every time, ahhhhhh. Only takes like 1/16" total to clear p-rod flares. 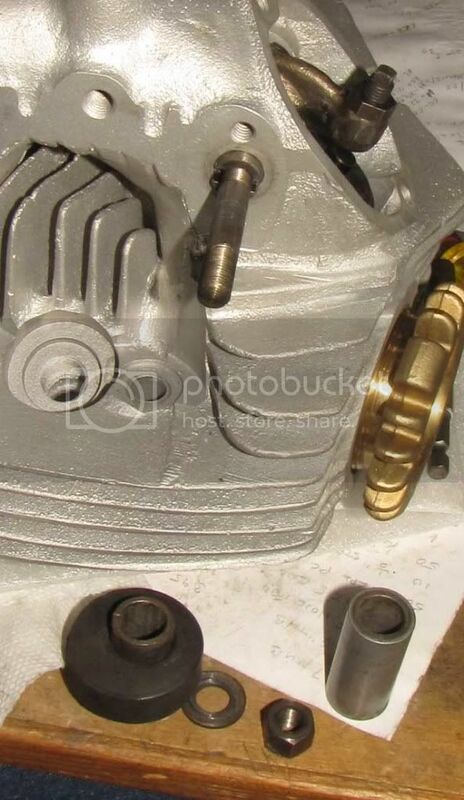 Some say the Z-plates are the most over built items on Cdo's, nope its the rocker arm clubs. Great, if I do need to pull it out, I'll heat it up locally with a gas torch for removal and installation. I guess AL expands more than steel with heat? Hopefully this won't turn into a project. Reason for this is one on the RH exhaust rocker, the mushroom adjuster won't go through it. All others are fine. Another $60 if British Only has one like they say and it is not emgo. The lighter bigger area mushrooms are nicer to the workings. Get their rub marks in middle of hardened valve stem caps and go chew up some road life w/o a care in sight. Well, here are my valve ends after 13K miles. Yes sir standard view of factory set up after a few dozen gas tanks use. The mushroom kit i've used had hardened caps for valve stems to delay this indenting a good bit further down the road. Just a bit more time money and will power to leave ya grinning deep inside. 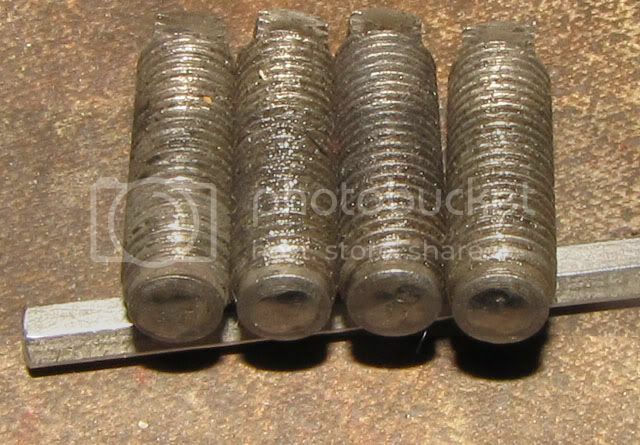 My engineis apart now, and my valves are about 10K miles old with dents like yours but much smaller. I had the larger mushroom head adjusters, with the allen screw adjusters. I have just fitted Black Diamond valves, I believe they are supposed to last longer, and are harder in the stem tip. I used the slide hammer puller, used for taking off ignition plates etc. Works a treat after heating the head locally next to the rocker pin. Atleast your stem wear shows the rocker geometry is pretty good, but one valve looks like the adjustment was let go too far? When I installed new Black Diamond valves (my old valve stems looked just like the pics posted earlier in this thread), I purchased mushroom head adjusters to go with them. 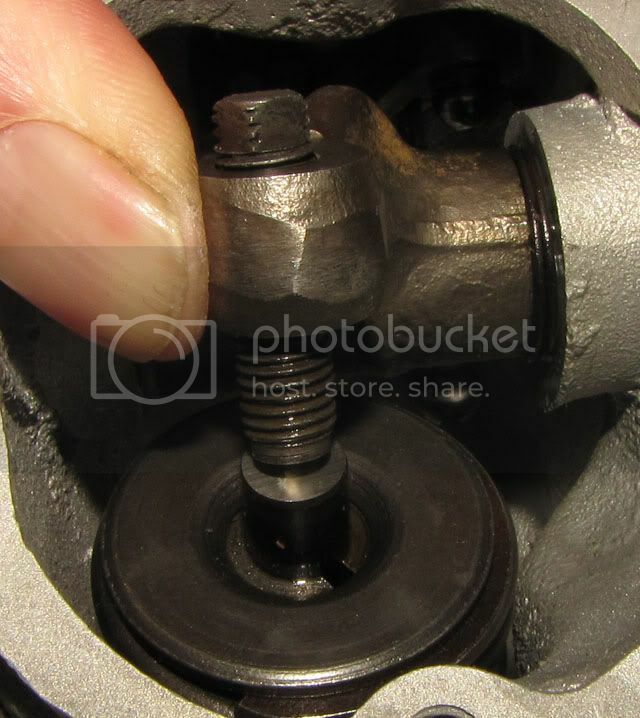 But when I checked the alignment, I found that that mushroom heads essentially hit the edge of the valve stem. I didn't like the look of that so I installed new oem adjusters with the new valves. The oems at least hit the stem on the top, though not necessarily centered. 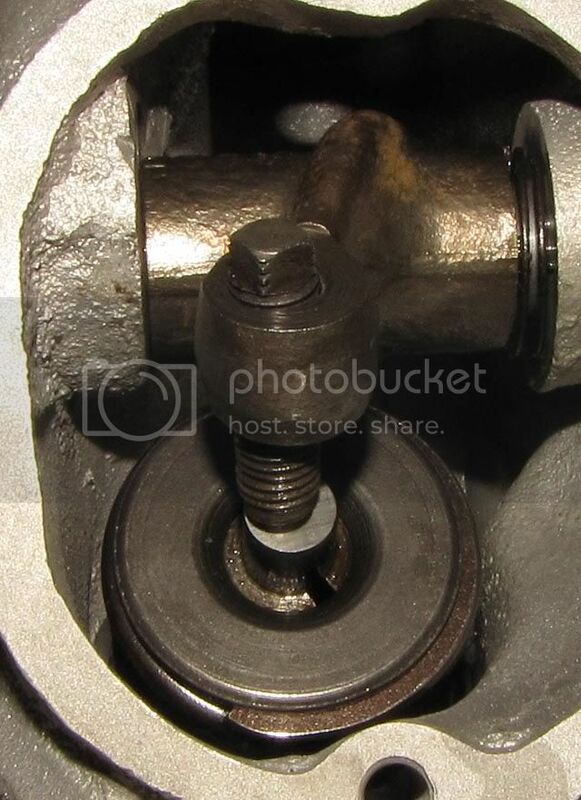 I don't see any way to make an adjustment on how the adjusters hit the valves so it seems to me that the factory tolerances of the parts - rocker shafts/valve guides alignment in the head, depth of valve seating, etc - determines whether mushroom adjusters will be helpful. I don't know if there is a better way to deal with this and maybe the "shrooms' hitting the edge of the valve was OK but it just looked really bad to me - more like they were trying to push the valve sideways rather than down. Bill, I see what you mean. Here is my old adjuster run out so you can see where it hits the valve. And here it is with the rocker pushed to the right. Looks like I need to get some shims. Too bad Leo didn't do this for me, otherwise a nice job, and I have no way to deal with the guides. I'll have to do a test fit of the head to see how the adjusters hit front to back and then adjust the rods if necessary. Looks like I need to get some shims. Too bad Leo didn't do this for me. I guess he didn't check and shim the springload either. Explain please, I am not a mechanic. I think you mean "Leo's shop" not Leo himself. Is Leo even working there anymore? I don't know if Leo is actually doing the work, but he was the one I always talked to while it was being done. How do you measure the springload?